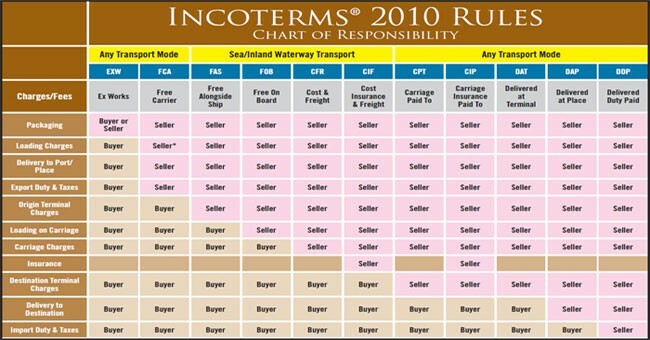 Incoterms and how to Configure Incoterms? Incoterms is an international commercial term which defines the terms of sale and the passing of risks for import and export of merchandise. Incoterms plays an important role in global business. In other words, Incoterms is the codification of international rule for the interpretation of the commonly used terms in foreign trade. Go to Sales and Distribution --> Master Data --> Business Partners --> Customers --> Billing Document --> Define IncoTerm. Here you can create and assign it in your customer master so that whenever order is generated for that customer, it will populate automatically into the sale order. This u can do in the Item category in Transaction VOV7. In customer master Sales Area Data, go to "Billing Documents" tab where you can see the fields "Incoterms" and "Terms of Payment". Whatever you maintain here, that will flow by default into your sale order both at header level and also at item level. spro-sd-masterdata - billing doc-Define incoterms. Incoterm is determined by customer master - Sales Area Data - Billing Tab. For configuring new incoterm u can configure in SPRO. IMG-> SALES AND DISTRIBUTION-> MASTER DATA->BSINESS PARTNERS-> CUSTOMERS->BILLING DOCMENTS->DEFINE INCO TERMS. And then assign the Inco terms defined in the customer master in the Sales area tab in the Billing docments screen. Suppose in the sales order, there are two items. For the first item, business data must be identical to the sales document header, while the second item allows different business data. How to cofigure this scenario. You can manually go to change mode of the sales order 2nd line item and change the data required for the line item manually in Item level like Incoterms, Payment Terms etc. If you want different from line item to line item then you need to enter manually at item level. SPRO>Sales and Distribution>Master Data>Business Partners>Customers>Billing Document>Define Incoterms. Once configured you can directly maintain the same in Customer Master--> Sales Area Data >Billing Document> Incoterms.